With only 3 weeks left until the kids and I travel I really need to start cracking down on all the things that need done before I leave. It is so hard to get motivated some days, though. I know what all needs done but I get distracted so easily by the kids or the daily chores. If you were to visit me in the morning you’d see me running around like a crazy person in the middle of at least three chores while I listen to Piano Guys on spotify. And then a child will run by claiming to be half starved so all the chores go on pause while I get them a snack. By that point I have completely forgotten about those other chores I was working on and pick up the broom to start sweeping. Some days a To Do List is just needed. There are many benefits to making a to do list. Some days it feels like nothing got done but then I look at my list and see that I did do a lot. They help me organize my chores so that I see exact things that need done. Sometimes in my mind there are a billion things that I need to right now! I will share what I have learned in the past week about To Do Lists. First, and most importantly, make it look good. I am way more likely to continue to pick up a list throughout the day if it is bright and colorful (can you tell I spend most my time with toddlers?) Last week I used this free printable. I really like it because it has three columns which I use for three different lists. This website also has some really neat free to do lists. If you don’t want to print one off get creative with some crayons (if you don’t have any you can come here and check under the couch cushions for some. There are usually a couple there). Whatever you choose, make sure it looks attractive to you. 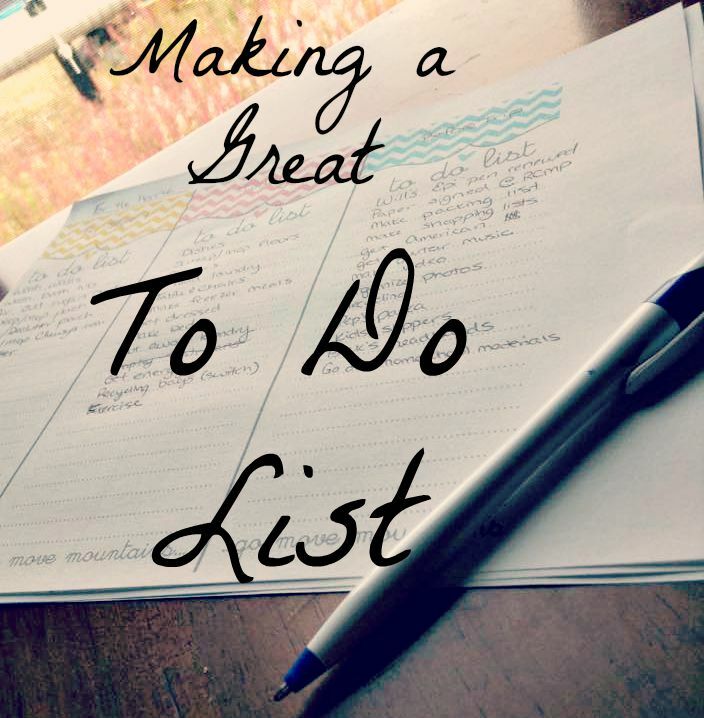 Next, don’t go overboard with your list. Make it realistic. When I make lists I like to write down a handful of “freebies” like get dressed, devotions, make list, eat breakfast, etc. Things that will definitely get crossed off the list. Then I add a couple things that happen everyday like dishes, sweep, 1 load of laundry, exercise. Then I will put on some hard stuff like mopping, cleaning the bathtub, etc. But only put on one or two really time consuming tasks. There’s no point in feeling like a failure at the end of the day. Lastly, prioritize. What needs done this morning? What needs done today? What needs done this week? I like to organize my lists like this: To Do Today, To Do this Week, To Do this Month. I always work hardest on the things that I need to do today. That’s the list with priority. But if I get something crossed off the To Do this Month list then Hey! High Five! Here’s a cool list for when you are prioritizing that way. Here’s my pinterest board with all my favorite free printables. Ok, I am off to make my to do list now! What are some of your favorite To Do List techniques or tips?